The same models, issued under five different names plus copied models.... kind of confusing isn't it ? Here is what we've found sofar. British manufacturer founded in 1946 that produced metal (zamac) toys (cars, stagecoach, steam engine..etc.) in various scales ranging from 1/32 to 1/100 scale. After 1949 the companies name was changed to Morestone, the name of the company that distributed Modern Products toys untill then. We know 3 models in smaller scales close to 1/87. 4 Steam Engine 0-6-0 "British Railways"
Morestone (Morris & Stone) launched many models from the Modern Products moulds for 10 years (1949 to 1959), after that, all models were re-issued under the Budgie Toys brand. Several models were in either HO or OO scale. 16a AEC Bus "Finest Petrol ESSO Extra in the World"
16b AEC Bus "ESSO for happy motoring ESSO"
16c AEC Bus "Motor Oil ESSO Petrol"
30 Magirus Deutz Dump truck "Klockner Trucks"
31 Scammel Tanker "Liquid in Bulk"
32 International Refrigerated transport " Coast to Coast refrigeration"
In 1959 Morestone became Budgie-Toys which changed to Budgie Models Ltd. from 1961 until 1966. The company made a new start in 1969 as Budgie (Seener Ltd.) and continued making models under the Budgie (Starcourt Ltd.) name from 1983 until 1986. 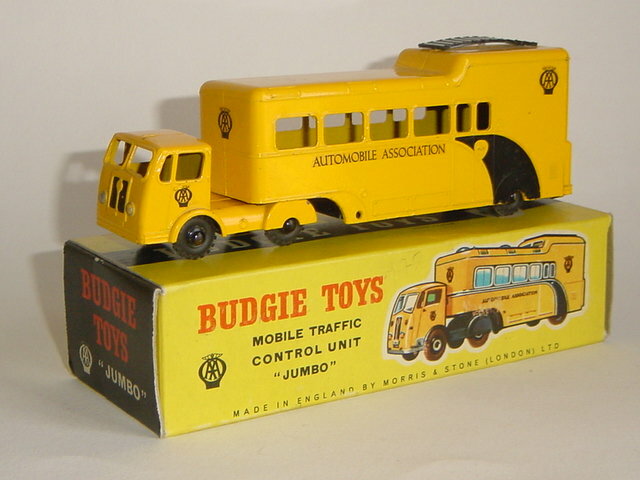 Many different models were made in many different scales and several small series appeared under different names like ESSO (box looked like a petrol pump), Mobile Vehicle, Modern Vehicle and Budgie. (see further below) Here is the list of the models in (near) HO and OO scales. 202 International refrigerated transport " Coast to Coast refrigeration"
206 Leyland Hippo 6x2 Coke transporter "Coal and Coke"
216 Renault 120CV 1955 tarpaulin flat truck "Fresh Fruit Daily"
218 Seddon Diesel articulated mobile traffic control unit "AA Automobile Association"
222 International articulated low loader + Centurion tank "US Army"
224 Steam Engine 0-6-0 "British Railways"
230a Seddon Diesel articulated wood transporter "British Road Service"
232b Seddon Diesel articulated low loader with 3 cable drums "Aluminium Wire & Cable"
236-1 Leyland Routemaster Bus "London Transport / ESSO Golden ESSO"
236-2 Leyland Routemaster Bus "London Transport / ESSO Uniflo the tune Motor Oil"
236-3 Leyland Routemaster Bus "London Transport / Uniflo SAE10W50 Motor Oil"
236-4 Leyland Routemaster Bus "London Transport / Houses of Parliament Tower B"
236-5 Leyland Routemaster "London Transport / Go ESSO buy ESSO drive ESSO"
236-6 Leyland Routemaster Bus "London Transporter / Sheraton Heathrow Hotel"
252-1 Austin articulated lorry with container "British Railways"
252-2 Austin articulated lorry with container "British Railways - Door to Door"
256 Foden aircraft refuelling tanker Pluto "ESSO Aviation Products"
270 Leyland articulated tanker "ESSO Petroleum Company"
276 Bedford 6X2 Dump truck "Ham River Grit Sand Ballast Shingle"
280 AEC articulated aircraft refuelling tanker "Air BP"
288 Albion 8X4 flour tank silo "Bulk Flour"
292 Albion 8X4 tanker "You feel a lot better if you drink more milk"
296a BMMO Coach "Birmingham London Motorway Express / Midland"
296b BMMO Coach "Washington DC / Blue Line Sightseeing Co."
298 Alvis Salamander 6X6 fire engine "Fire Service"
308 Seddon Diesel articulated low loader Pitt Alligator "Pitt Trailers"
312 Bedford 6X2 Dump truck "STM Super Tip Master"
322 Scammell Routeman Pneumajector 8X4 flour silo tank "The Atlas Carrier Co. Flour"
704 Leyland Routemaster Bus "Buy almost anything in London on this bus / Shop Linker"
705-1 Leyland Routemaster Bus "25 Faithful Years / Budgie Transport"
705-2 Leyland Routemaster Bus "The Boys Brigade"
706 Leyland Routemaster Bus "Watford F.A.CUP Final 84"
709 Leyland Routemaster Bus "DHL Worldwide"
710 Leyland Routemaster Bus "London Transport / The Boys Brigade"
Issued as a kind of low-budget competition to Lesney / Matchbox, these ranges include models in various scales ranging from 1/43 to 1/120. They were sold either in the "ESSO" box (petrol pump design), the Modern Vehicle or Mobile Vehicle box or the Budgie blister pack. There are more models in these series, but since these are in 1/60 or 1/64 scale they are out of the scope of this site. 5 Wolseley Police car ? 7 Mercedes-Benz racing car ? 12 Volkswagen bus (pictured above) ? 13 Austin FX1 London taxi ? 15 Austin A95 Estate Car ? 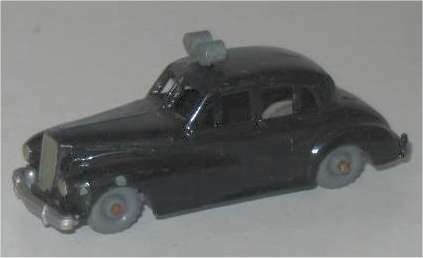 27 Wolseley Firechief car (pictured above) ? 58 Ford articulated tanker "Mobilgas" ? Copies of Budgie Ref# 230 tractor and Ref#270 trailer, made in India.
? Seddon Diesel articulated tanker "India Oil"